We know our galaxy as the Milky Way. However, there are billions of other galaxies out in our universe all of which have millions to billions to trillions of stars! PGC 83677, seen as the brightest and largest galaxy in the image below, is a huge lenticular galaxy. 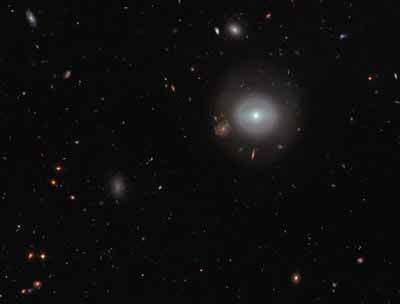 What exactly is a lenticular galaxy? Lenticular galaxies are a specific classification of galaxy which are similar looking to elliptical galaxies. They have a disk shape like our barred-spiral Milky Way, however they lack distinctive spiral arms due to lack of dust. Lenticulars like PGC 83677 contain mostly old, red stars signifying that star formation has slowed down greatly. At the center of PGC 83677, astronomers have detected high energy X-rays and ultraviolet light. This make us suspect that a monstrous black hole lies in PGC 83677's center. This galaxy is located in the constellation Coma Berenices residing about 300 million light years away from Earth.